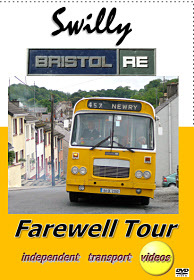 ‘The 35-year reign of the Bristol RE with Ulsterbus and Citybus came to an end in 2004, but for a further three years 33 of these charismatic Alexander (Belfast) - bodied vehicles (although 5 were not operated) served in some of the most scenic and remote parts of North West Ireland with ‘The Swilly'. On 23rd June 2007 the Irish Transport Trust organised a tour to mark their imminent withdrawal from the fleet (victims of Government age restrictions on school buses), and our cameras follow this farewell day. We begin with arrival, from Belfast, of the main party on two preserved REs, Ulsterbus 2583 (BXI 2583) and dual door Citybus 2415 (VOI 8415). They meet up with its one-time Belfast stable mate Swilly 457 (84-DL-2348, formally BXI 2568) prior to its departure from Londonderry's Foyle Street Bus Station. First stop is Swilly's depot on the Springtown Industrial Estate, where we see several Bristols parked up. There then follows a run into County Donegal – stopping initially to look at 474 (84-DL-2363, formerly AXI 2547) in sleepy Manorcunningham, and then up to the Swilly depot in Letterkenny, where 459, formerly (AXI 2539), is moved for filming. After lunch, the two REs head out from Letterkenny Bus Station where we also see 453 (85-DL-2603, formally BXI 2580, the last RE new to Citybus) heading northwards towards Rathmullan, past 454 (85-DL-2597, formally BXI 2571) and up as far as the Swilly Ferry terminal before running back down the coast again into Ramelton. Following a brief stop, we see the two tour REs attack the steep hill out of this attractive little riverside town, and then after passing through Letterkenny again we're guided down some very rural roads to an obscure parking spot at Ballyboe containing 464 (84-DL-2359, formally AXI 2535). Leaving here we cross the course of the long-closed Londonderry and Lough Swilly Railway (still The Swilly's proper title), head for Reddin's Coaches of Muff for a visit and then it's back to Derry city centre where we watch 457 depart for the last time.